Classic snap game where the user must match pairs of Celebs. 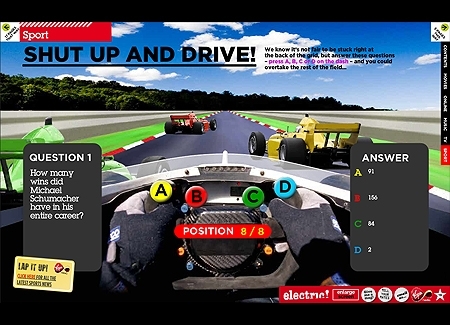 The card turning is animated and on a correct match the names are displayed on the card. 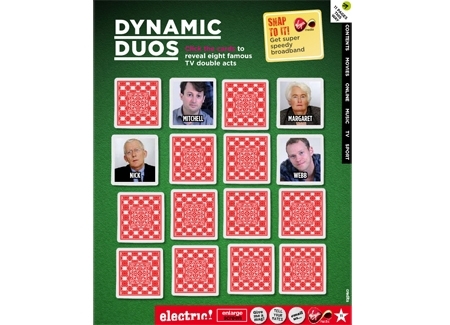 A fun cryptic quiz of television program titles. Both flash cookies and a database collect the users email and position in the game allowing them to return at a later time and continue from where they left. Data captured can also be used for future marketing purposes where the user has agreed via the tick box. 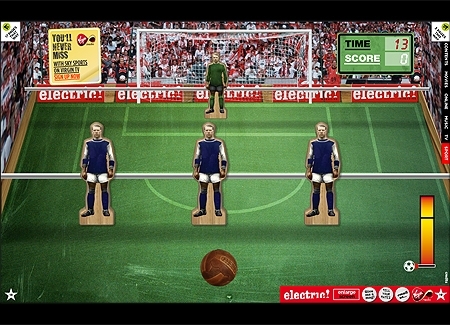 Table football game, where the object of the game is to shoot into the goal. The mouse controls the left and right movement and a power meter rises when the mouse is pressed. Timing is crucial, let go of the mouse at the right moment to ensue that enough power will get that ball into the Goal. Too much and it will bounce off the posts. Recreation of a classic arcade favorite. 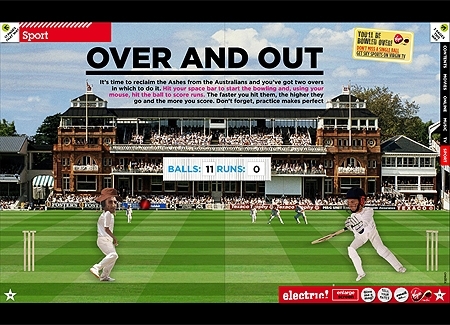 Playing against the computer, this version features change of speed if the ball is hit at the right angle which is useful for catching out your opponent. First one to reach 21 wins! 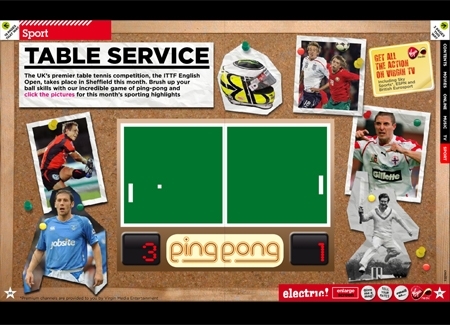 Other interesting sport facts are included at the edge of the screen. 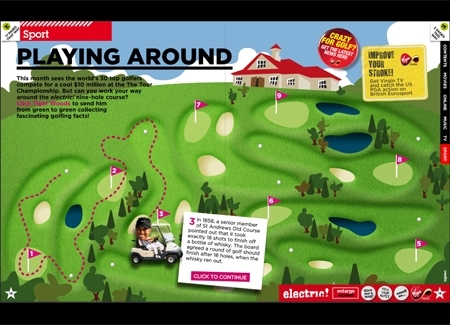 A round of golf where each hole has an interesting Golfing fact. The path of the golf buggy is animated to comic effect. 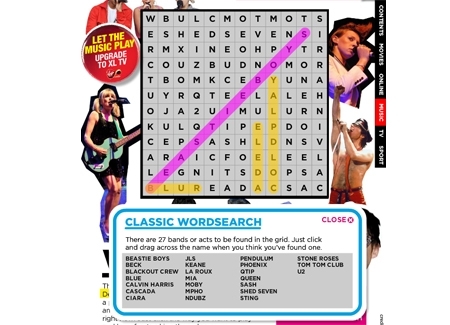 Musical word search. 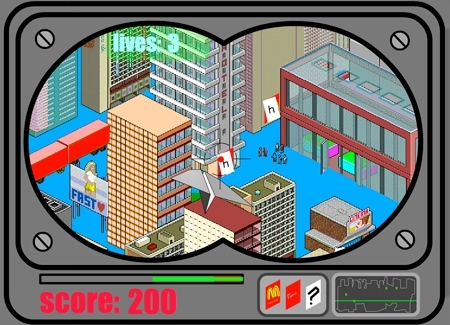 The game featured two modes of operation, normal and timed word search. Colorful visual feed back ensured that the user understood which words had been found and which were currently selected. 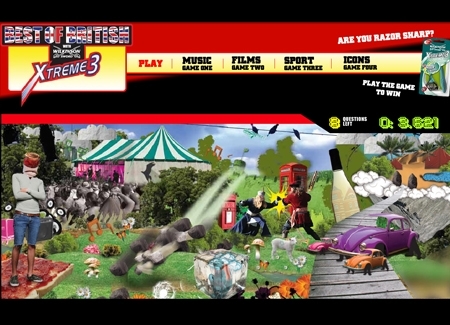 The game was programmed to be reusable. 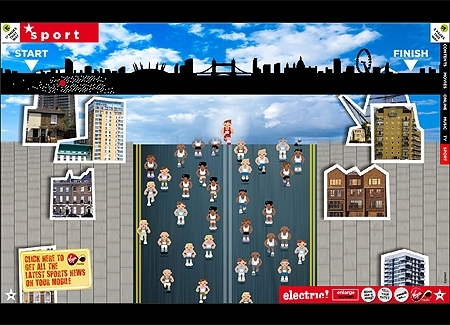 London marathon game where the player has to get ahead of the crowd by repeatedly bashing the left and right buttons of the keyboard. The quasi 3d visuals maintain the illusion of running through London and passing various sites on the way. A display at the top of the page tells you where you are on the route in relation to the crowd. 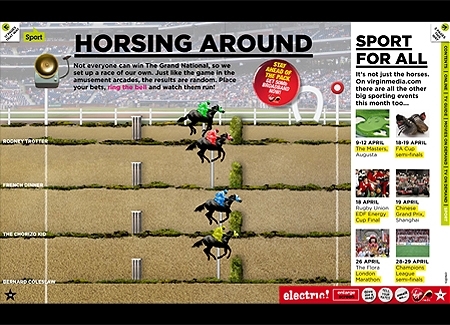 A colorful recreation of an old arcade style horse racing betting game. Choose your horse and ring the bell to start the race. There are multiple random number generators to vary each horses speed throughout the race and make it more compelling to watch and play again! 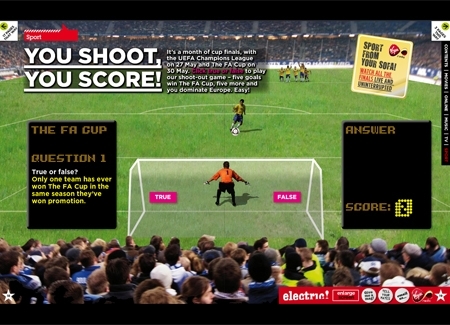 Answer the questions true or false, if you are correct you see a goal being scored if not feel the embarrassment as the ball flies in the wrong direction. 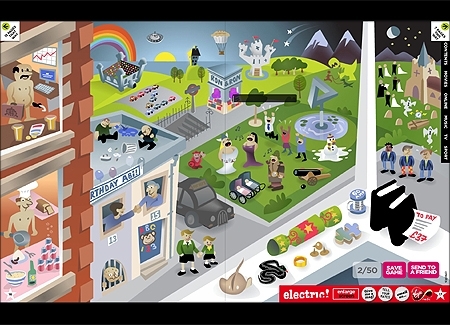 The game also features a viral send to a friend element.